Deflections: Is one practice enough to conduct a proper coaching field evaluation? Let’s imagine your supervisor at work wants to get a handle on how you’re doing your job. Your work is such that much of it is done on the phone or through email. The supervisor decides to sit near your desk for an hour to observe. What would he/she see? You’re a stay-at-home parent and your spouse wonders what you do all day. The spouse decides to shadow you for an hour to find out. Except that the hour chosen is the one when the baby is napping, the washing machine is on, the breakfast dishes remain, and you’re on the couch, folding towels and catching a few minutes of Law and Order. What would the spouse’s conclusion be? And so it goes when the likes of me need to go out to assess practices done by the likes of you. We call these field evaluations and they’re now being done for all coaches seeking High Performance or Development 1 certification. We assess one practice for each of those levels, though at HP, there’s also a game evaluation. The process is detailed with a standard set of evaluation forms created by the Coaching Association of Canada (CAC) and Hockey Canada. 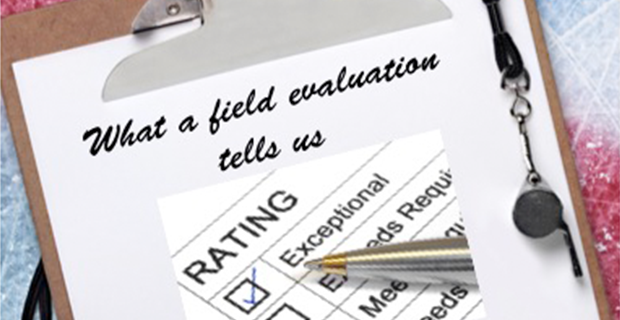 The most important part of the field evaluation though is the mentoring and feedback. As in the two real world examples, it’d be unfair to base an opinion of a coach’s practices on just one. This is particularly true for the Development 1 level because coaches there generally have far fewer practices. As a result, they need to do more multi-tasking of skills and tactics, often taking short cuts through progressions. No matter the level though, these field evaluations point out some key things about coaches’ soft skills, the ones that don’t really show easily through drills. We used to call them teaching techniques and probably not enough time is spent in coach training on what really is the foundation: communication skills, how feedback is given, time management, understanding age group considerations and their relationship to practice content, etc. The best drills are worth little if many of those teaching techniques aren’t solid. The CAC/Hockey Canada assessment tools effectively address these. Certainly the vast majority of my time assessing practices is spent discussing them with coaches in the pre-brief (time before the practice) and de-brief (time after). In a few instances I’ve had to return for a second practice to ensure the coach has addressed the concerns from the previous one. One practice is essentially a still frame snapshot from the film called “Your season.” It’s only meant to give a sense of a coach’s approach and to provide assistance. In other words, it’s a start.